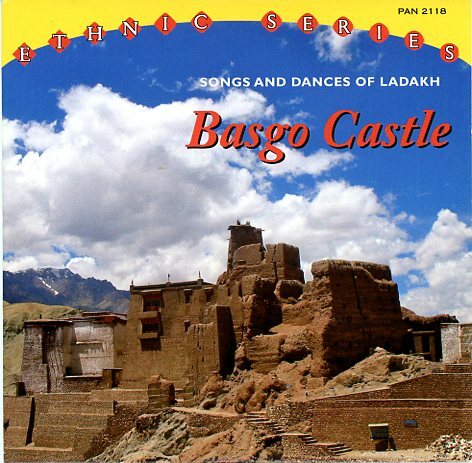 The songs and dances on this CD were recorded in the old Ladakhi capitals of Leh and Basgo. Two groups of musicians are represented: a group of cultural activists in Basgo, and two staff artists from All India Radio, Leh. Ladakh is a Tibetan cultural area located in a mountainous, high-altitude desert in the Indian state of Jammu and Kashmir. Located at the crossroads of Central and South Asia, it used to derive most of its income from caravan trade. A frontier culture acting as a buffer between Tibet, Central Asia, and India, it has a mixed Buddhist and Muslim population. Its long history of interactions and conflicts with its neighbors is reflected in its multi-faceted culture. Ladakhi music reflects this hybridity, having melodic styles, rhythms, and instruments from Western and Central Asia, but with lyrics in various mixtures of vernacular Ladakhi and literary Tibetan. The influence of Tibetan Buddhist meditation practices is strong in the songs associated with the Buddhist populations and the former Namgyal Dynasty kings. To best understand the songs on this CD a brief account of Ladakhi history is needed. Ladakh was established in the Tenth Century when a group of Tibetan royal families led by Prince Nyima Gon fled westward as civil war broke apart the Tibetan Empire. The powerful Buddhist Namgyal dynasty led the resistance to assaults by Islamic powers from the 14th Century until the conquest of Ladakh by the Dogras of Jammu and Kashmir in 1842. Since then it has been a part of India. The most celebrated of the Namgyal kings was Sengge Namgyal who ruled from 1616 to 1642. His military exploits and acts of devotion are so legendary, and in many songs that refer to historic events his name often replaces that of later kings. He built the great palace in Leh, as well as working with his lama Stagtshang Raspa to build various monasteries (Hemis and Hanle). Tibet. A full-scale war broke out in the 1680s, brought about by King Deldan Namgyal’s support for the lama who was spiritual and temporal head of Bhutan—Drukpa Kargyu sect, as opposed to the dominant Gelugpa sect of the Tibetans. A large-scale invasion took place in 1681, initiating what is referred to by Ladakhis as The Great Mongol War. The Tibetan-Mongol army quickly took Leh and laid siege to Basgo for almost three years. The fortress of Basgo, however, is virtually impossible to take, being only accessible by a narrow pass, and having a perennial water supply. However, King Deldan was obliged to call upon Kashmir for assistance. Although this was the beginning of Ladakh’s decline as a regional power, the resistance to the Mongols is celebrated, especially in songs from Basgo village. The most prestigious musical instruments in Ladakh are the double reed surna and the small kettledrum, the daman. These were originally brought to Ladakh by Sengge Namgyal’s Muslim Balti mother, Gyal Khatun, as part of her entourage. Consistent with Western Asian practices, the surna-daman ensemble represents military and temporal power and prestige. They are considered an indispensable part of any important performance of traditional music. Historically, surna and daman were played by low-caste musicians known as Mon. However, socio-economic changes have offered many Mon upward mobility, allowing them to abandon their despised professions. This has led to loss of repertoire in recent years. This loss has been counteracted by broadcasts on All India Radio, Leh, commercial recordings, and grassroots groups that have taken up the instruments, transcending the stigma in order to preserve their cultural heritage. The Basgo musicians recorded here are one such group. The songs from Basgo are typical in their praise of the village. Some refer to the siege by the Mongols. The songs are generally in strophic form having multiple verses, with the surna playing occasional instrumental interludes. The daman plays throughout. The instrumental dances are of four types: men’s dance, woman’s dance, the three-step dance, and a special women’s dance for the Losar New Year called Shondol. The songs offered by AIR artists Yanchen Dolma and Tsering Chorol are performed a cappella, without instrumental accompaniment. Two are narratives of princesses who have married and are far from home, one praises Hemis Gompa, an important Buddhist monastery, and one favorably compares Leh with the Tibetan capital, Lhasa.